Running down the state of California, from Cape Mendocino to the Mexican border, the San Andreas Fault forms a continuous, narrow break in the Earth's crust between the Pacific and North American tectonic plates. Seismologists predict that the fault will eventually cause the "big one": a 7.0+ magnitude earthquake on the Richter scale. At just over 28,000 years old, the San Andreas Fault is still growing at a rate of 2.5 inches (64 millimeters) per year, constantly reshaping California. The fault is divided into three distinct zones, each of which can be visited: the northern part via the Pinnacles National Park, the central part at the San Andreas Fault Observatory in Parkfield, and the southern part from the San Bernardino Mountains to the San Gabriel Mountains. Open-air Jeep tours head out to the Palm Desert to explore the fault, as well as the oasis and hot springs it created. Desert temperatures can fluctuate drastically, so dress in layers if you’re heading to Palm Desert on a tour. Wear sneakers or hiking boots to climb around the fault area. Be sure to apply sunblock, wear a hat, and bring water. Almost all traces of a crack in the earth along the fault line were erased by the 1906 earthquake that leveled San Francisco; what remain now are geological rock formations. The southern part of the fault begins near the San Bernardino Mountains, just outside of Los Angeles, and runs east to the San Gabriel Mountains, with Palm Springs being the best place to explore the fault. Palm Springs is located about an hour and 45 minutes southeast of LA. Tours typically begin at a location in Palm Desert, not Palm Springs. 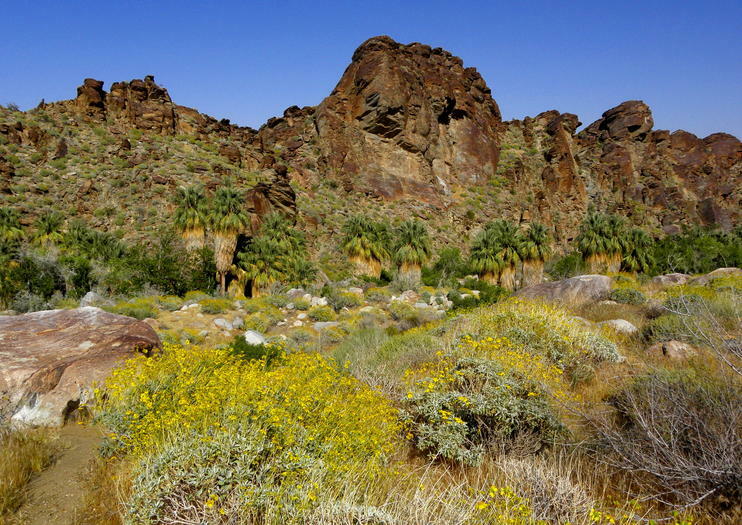 If you’re planning to head out to Palm Desert to tour the fault area, book your trip between January and April, when the weather is the most pleasant. During the summer, temperatures regularly rise above 100 degrees. If you want to explore the northern section at Pinnacles National Park, which is near Big Sur, aim for some time between September and November for optimum weather conditions. Named for the Joshua trees that are native to the Mojave Desert, Joshua Tree National Park is located near San Bernardino and Palm Springs. The protected area boasts plenty of outdoor activities, such as camping, hiking, rock climbing, and birding, and many tour companies offer rides in 4WD vehicles, to explore the park and its wildlife. Adventure through the desert to the San Andres Fault on this sunset tour by Jeep. Ride from Palm Desert to the fault in an open-air Jeep as you take in beautiful views of the desert at sunset and then under the starry night sky. Along the way, hear stories about the people who previously inhabited or settled in the area. Plus, enjoy personal attention from your guide on this small-group tour, limited to seven people. Enjoy an evening of stargazing in the California desert on this guided small-group tour from Palm Desert. Explore a private, 800-acre preserve on the San Andreas Fault and learn about the desert’s plants, animals, history, geology and earthquakes in an open-air Jeep. Then examine the dark, starry sky with a hand-held tracking device. Granola snacks, bottled water, and a pickup and drop-off from select Palm Desert hotels are included.